Our simulation platform enables developers to get up and running quickly with a cloud enabled command line and web interface to test and validate AI through simulation. Currently supporting the automotive industry with the CARLA open source simulator and proud sponsor of the CARLA Challenge – a competition to create the safest self-driving AI. Capable of supporting any simulator for AI training, testing and validation. 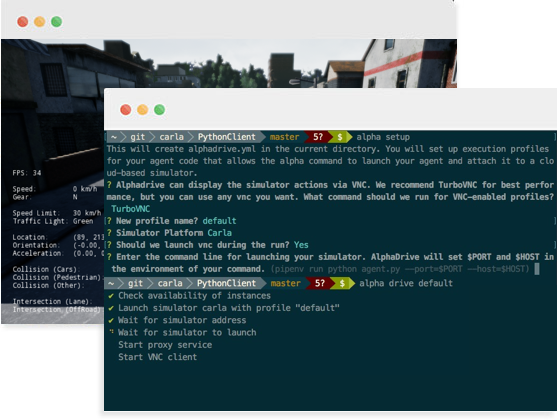 We've created a CLI to get you up and running in minutes, not hours. Run your simulations in the cloud, not on your computer. When simulations are done running, you'll be able to quickly and easily see and share results.